Belize does not immediately come to mind when thinking of hot bed areas for ghostly activity, but in fact it has one of the more intriguing and long-lasting ghost stories I’ve run across in recent years. 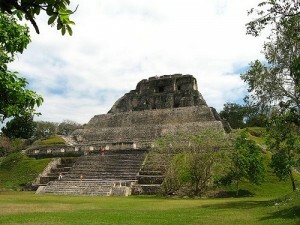 The ancient Mayan ruin of Xunantunich lies about 80 miles west of Belize City. The phenomena is so strongly associated with the area that the site itself is now named after the ghost, Xunantunich is mayan for “stone woman”. Sightings of the stone woman begin in 1892 when several people living on the site saw a woman, dressed in white, ascending the stairs of the temple-pyramid at the site, known as “El Castillo”, and disappearing into a stone wall. The most notable feature is that she has glowing red eyes. In subsequent years, several other locals saw the ghost, and most recently a tour group from Canada seems to have spotted the lady, true to the previous accounts, shortly after sun down. Beyond that, little is known. There are, however, interesting aspects of the haunting if looked at within the confines of ancient Mayan culture. Firstly, the site is very old. Xunantunich flourished between 200 AD and mostly died away around 900 AD, likely because of a devastating earthquake. The site was generally unknown and grown over until the 1890’s, so it seems likely that the stone woman is perhaps the ghost of an ancient Mayan woman ascending the stairs of El Castillo to be sacrificed, or connected in some way to the ritual, to appease the gods of the Maya. If she is a Mayan from nearly two thousand years ago, it wouldn’t be surprising that she would ascend the temple stairs. Mayans were known for human sacrifice at the tops of their temples. Incidences of very strong emotion are often linked to the creation of a ghost, and I can think of few things that would be more emotional than a human sacrifice. 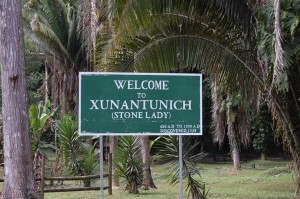 In the end, we’ll never know, but if the paranormal enthusiast reader ever gets to the jungles of Belize, Xunantunich should be on the top of your list as places to visit.